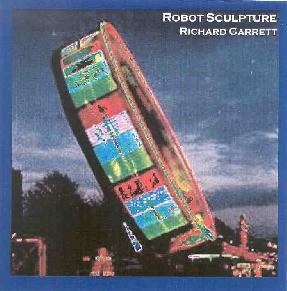 Richard Garrett - "Robot Sculpture"
This is a very interesting electronic music release by UK artist Richard Garrett. All the tracks except for 2 start by using SSEYO Koan Pro generative music software. The software generates random midi events within a few preset rules such as pitch and duration. This output is fed into the JV-1080 synthesizer and mixed. IF acceptable, the rest is used for making compositions, which include many different instruments from horns to guitars to flutes to tabla drums. Only some of the tracks are ambient space atmospheres. Track 3 is like piano jazz. "Highland Roads" (Track 6) contains some nice guitar playing you might describe as a bit Pinhas or Fripp inspired. "That Was No Yellow Ferrari" is bit like something Zappa might have composed. Interesting. You can really hear the Indian influence on some songs, from the keys in which the songs are played or the tabla drums. This is quite an interesting mixture of material and contains some nice guitar work. This approach really works well for Richard. I really loved the last track, "The Breath Of The Grey King". It made me feel like I was sitting out in the middle of nowhere in Wales in ancient times and looking up at the sky as a meteor storm blazes across the sky and I look up in amazement, not having any idea what is happening but enjoying the beauty of the moment. A very nice release. For more information you can visit Richard Garrett's web site at: http://www.stonygap.demon.co.uk. Contact via snail mail c/o Sunday Dance Music; PO Box 55; TYWYN, Gwynedd; LL36 9ZE; UK.